One of the joys of summer is making and eating gazpacho, that cold Spanish soup that is a kind of semi-liquid salad. I usually get a craving for this dish out of the blue, and, when I do, I have to go to the supermarket, collect the necessary ingredients, and throw them together as quickly as possible. One summer, I discovered that the local T.G.I. Friday’s served gazpacho, and I spent summer afternoons reading at one of its outdoor tables while eating gazpacho and drinking gin and tonic. The last time I stopped by T.G.I. Friday’s, however, no one on the staff had ever heard of gazpacho, and it was certainly not on the menu. Thus, when I experienced my annual need for a gazpacho fix a few days ago, I knew I was on my own. I didn’t even take the time to track down my usual recipe; I went to the Web, found some tasty-sounding instructions, and ran off to the store. The resulting soup was chunkier than usual but was especially delectable. The recipe yielded a lot of gazpacho. Unfortunately, the warm summer weather I usually associate with the dish is not now in evidence. It has been cool and occasionally raining in Pittsburgh over the past few days. 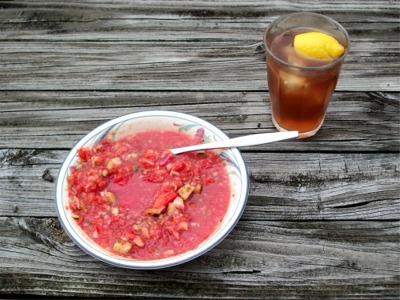 Nonetheless, I had gazpacho and a glass of iced tea for lunch today, and I ate outside on the deck. The temperature was only in the high 60s, but lunch was very satisfying. Delicious-- oddly, our day looks the same (we are in ¨rainy season¨ but the gazpacho lives on).